The Azoris Royal Garden is located on the largest island of the Azores, São Miguel, a stunning island where you can enjoy memorable experiences and unparalleled natural beauty. In the city of Ponta Delgada, a few meters from the historical center, the Azoris Royal Garden has a total of 193 rooms: 1 presidential suite, 5 senior suites, 6 triple rooms, 37 executive rooms and 144 standard rooms. It also has 5 venues for meetings and events, offering services such as internet, video conferencing, and video and audio systems. There is a Restaurant available every day for lunch and dinner, with service à la carte or buffet - at specific times - facing the gorgeous zen garden view. There are regional, national and international options for your meals, including dishes with Açores Brand products. At our Royal Bar you will be able to take a long or hot drink, along with light meals during the afternoon and evening. Our coffee-shop, overlooking our gardens, serves the outdoor pool during summertime. Natural light floods the hotel, comprising an incredible Zen garden, ample lounge areas and two splendid swimming-pools (indoor and outdoor), a spa area – the relaxing Lotus Spa -, hairdresser, Jacuzzi, Sauna, Turkish Bath, Gym, Game Center and Tennis Court – all of this making the four-star hotel the best option to welcome you on your discovery tour of the island of São Miguel. It also provides an indoor car park, free for guests who book directly on our website. The Azoris Royal Garden offers you comfort, tranquillity and leisure time for an unforgettable experience. Check all our services and our image gallery. Ride quietly while discovering Ponta Delgada, on the promenade along the sea, through the beautiful gardens of the city, or through the most characteristic streets of the historic center! A selection of regional, national and international dishes. The reduction of tourism impact on the environment in which our hotels are located. Thousands of magazines and newspapers with just one app! The Azoris Royal Garden is located in a privileged area of Ponta Delgada city. São Miguel, the largest island of the Azores, is around 62 km long and 15.8 km at its widest. 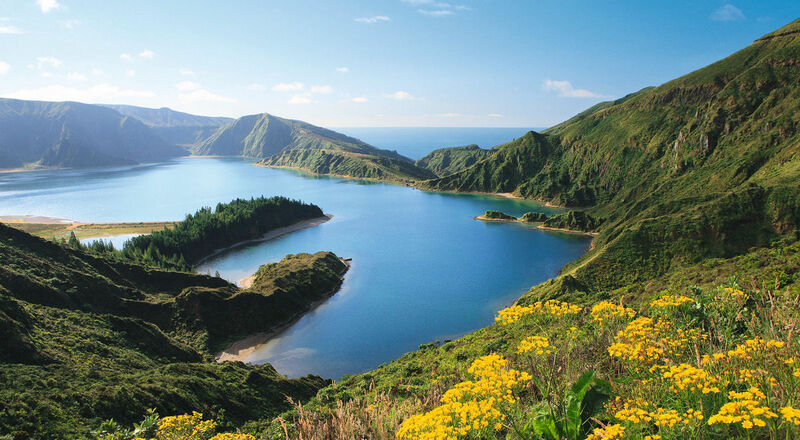 With about 137,856 inhabitants (2011 data), São Miguel is an island form the Eastern Group of the archipelago with the island of Santa Maria. Called Green Island, the landscape is characterized by extensive meadows and forest patches forcibly implanted in the valleys of the rivers and area of difficult access. You can enjoy unique landscapes by walking paths or even by horse or bike riding, among many other practices possible to do in a true Nature destination. The discovery of the underground world of the island is on a visit to Coal Cave. The diving and whale watching are some of the activities you can enjoy to. Read more .